Heritage practice and legislation can be complicated. 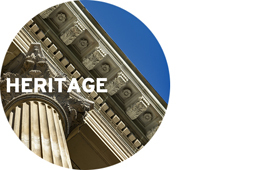 We have extensive experience in negotiating pathways through a range of heritage issues and situations. Our work includes the resolution of appropriate approaches to maintenance of physical fabric, alterations and additions, adaptation and new devlopment. In all cases, we are guided by best practice guidelines (including the Burra Charter) and relevant statutory controls. Lovell Chen’s advice and appraisals service provides practical support to owners of heritage properties of all types. Based on more than 35 years’ experience, we have in-depth knowledge of all building styles and periods, from earliest settlement to post-war Modernism. Our approach seeks to strike a balance between owners’ requirements and the conservation of our diverse cultural heritage. In the first stage, we undertake preliminary work to appraise a property, undertaking limited physical and contextural analysis. This is accomplished through a site visit and inspection, plus desktop research. The result is recommendations for a way (or ways) forward. Once the property owner has developed a scheme based on our initial work, we prepare either a preliminary report or a heritage impact statement in support of a planning or heritage application, as necessary.